We provide ONE ON ONE BEHAVIORAL COUNSELING at no extra charge. You can CALL at any time: day, night, weekends, etc. Once you COMMIT to us, we are COMMITTED to YOU. You will get HELP/INSTRUCTIONS even before your classes start. All household members are encouraged to participate in the training. from your dog while ENJOYING your dog. FORMALITY and not a NECESSITY. HUNDREDS of $$ for dog training! The above list is subject to change daily! Why train your dog? Click here for the answer. Basic classes include graduation at the end. Dogs of all ages can be taught these AMERICAN KENNEL CLUB (AKC) exercises: HEEL, SIT, SIT STAY, STAND, STAND STAY, DOWN, DOWN STAY, RECALL and FINISH (and many socialization exercises). 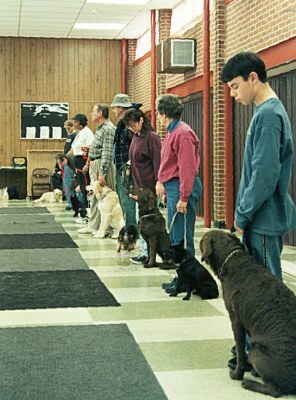 In the first five minutes of the first Basic class, the handlers are taught how to control their dog on a loose lead and collar. Handlers need a properly-fitted collar (some dogs and puppies may be able to use a regular buckle collar or a "martingale collar"). A 6-ft leash, NOT CHAIN or RETRACTABLE, is required in order to do all of the exercises during the entire course. Please bring current shot records for your dog to the first class. Please note: Puppies must be at least 12 weeks old at the start of the first class! Please call 301-345-6999 and schedule a date and time to observe one of our classes, this will allow you to make what Allie calls: "an open-minded decision." After a 15 or 20 minute visit, you will be able to decide if you want to join us. Please note, you will not be allowed to observe the first class of a new class session. If you just show up at a new class session, you must join that class, or schedule a time and date to observe. Beginning AGILITY, RALLY, and FLYBALL; OFF-LEAD heeling; HAND-SIGNAL commands; RETRIEVING; DISTANT "RECALL," "SIT & DOWN" Stays; Extensive SOCIALIZATION . . . . . and more. PRE-REQUISITE: Completion of a BASIC course with Mr. Lee or an appointment to evaluate you & your dog's eligibility for the course. Selected from "The Cream of the Crop"